Mill Spring, N.C. - Five horse-and-athlete combinations have been chosen to represent the United States at the FEI World Equestrian Games™ (WEG) Tryon 2018. 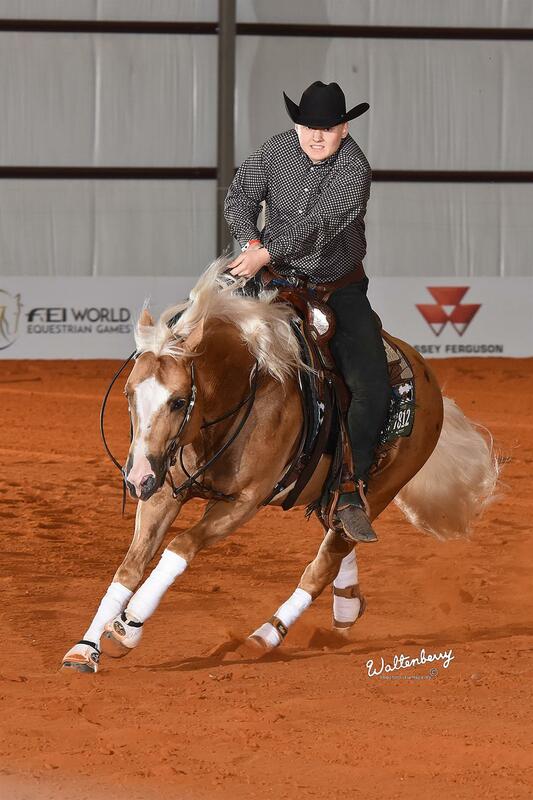 Cade McCutcheon (Aubrey, Texas) will represent the U.S. in Tryon, riding Custom Made Gun, a seven-year-old Quarter Horse stallion owned by Tim and Colleen McQuay. His father, Tom McCutcheon, will ride The Wizster, an eight-year-old Quarter Horse gelding owned by Turnabout Farm. Representing the U.S. at the WEG is all in the family for the McCutcheons. Cade will be the youngest competitor to represent the U.S. for reining in the history of the WEG. Cade’s grandfather, Tim McQuay, and his father both contributed to the U.S. Reining Team’s gold medal at the 2010 FEI Alltech® World Equestrian Games. Tom McCutcheon, also won a team and individual silver medal from the 2002 WEG and individual gold medal at the 2010 WEG. Both McCutcheon and McQuay have won many medals along the way. Cade’s daily life is full of long working days. Living in Texas on a significantly busy working ranch in a family that breeds and trains so many great horses, Cade's daily schedule includes some long hours. "Today, I got up at 4:30 a.m., and I rode all morning until one o'clock at my dad's,” he explained. “Then, I had a quick lunch, and I rode a couple of horses at my grandparents’. I finished around 4 p.m. or so.” He said, “It’s such a privilege. I've gotten to ride a lot of good horses just because of growing up with my dad, my parents, and my grandparents. There are a lot of good horses around. It's helped me a lot in my development and to be where I am now,” he said. Be sure to cheer Cade on as he competes in his first WEG. He encourages everyone to watch the reining competition. "I'm excited to go,” he said. “It's a great opportunity, and I hope that everyone from the U.S. comes and watches, because it really helps."